When I was a special education teacher I loved using graphic organizers -- KWL Charts, Venn Diagrams, storyboards, charts, and webs -- to encourage student participation. 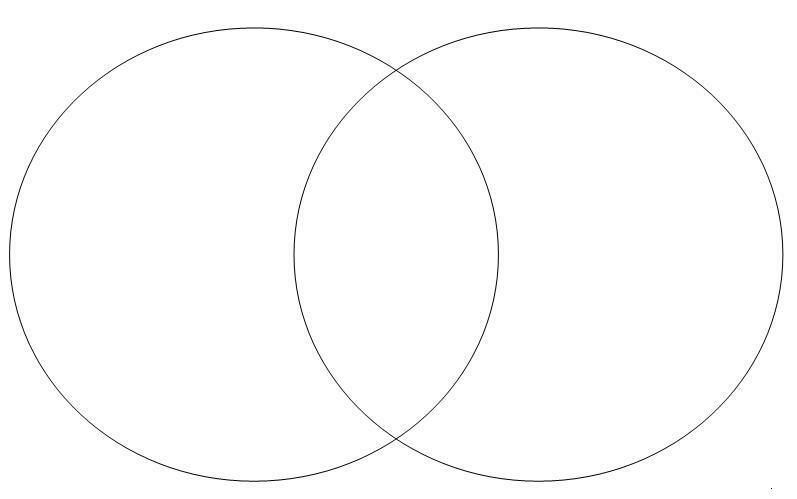 By far my favorite was a Venn Diagram, two interlocking circles used to compare and contrast two things. I often used this graphic organizer to examine the similarities and differences between two characters from a story or two picture books. Every student was able to share and contribute to the diagram because there was always plenty of correct answers. It was one of joys of teaching to see students unite in the learning process by sharing their ideas, listening to others, and gain understanding. This week, reminiscing about my teaching days was a result of reading Different Just Like Me by Lori Mitchell. In addition to thinking about the lessons I taught, I thought about my former students. I thought about their differences -- learning styles, demeanor, interests. I thought about their similarities -- what made them laugh and smile, that they all wanted to feel loved, their struggles with school. I find myself wishing I would have known about Lori Mitchell's birthday 10 years ago when I was celebrating author birthdays in my classroom, because her book would have been a joy to read with my students. In Different Just Like Me, April can't wait to visit her Grammie's house, but the visit is a week away. April and her mom keep busy throughout the week by running errands, visiting her dad at work, and eating at her favorite diner. 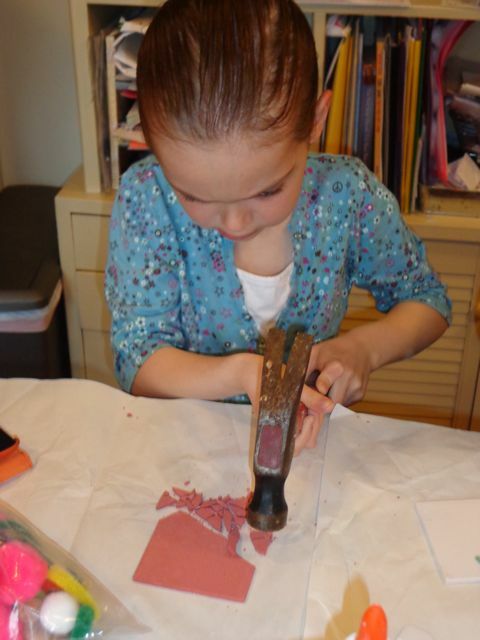 With all the activities to keep her busy April's mind is able to focus on other things besides the visit to Grammie's. She notices many different people -- shoppers at the farmer's market, a woman using braille and a guide dog to navigate an elevator, and a little boy in a pirate hat at the train station -- but each person has something in common with her. Friday comes quickly and April's visit is highlighted by time spent in her Grammie's garden, where she realizes that the flowers were just like all the people she had met throughout the week, "different from one another, and that's what made them so great!" Lori Mitchell wrote and illustrated Different Just Like Me for her daughter, April. When April turned four years old her Vitiligo was much more noticeable than when it began when she was eight months old. Vitiligo is a common, genetic, skin disease in which there is a loss of pigment from areas of the skin resulting in irregular white spots and patches. (Vitiligo Support International). Many people began to ask questions about April's differences and in turn April started asking questions about the many differences she observed with people around her. Lori decided that reading a book may help April better understand that "we are all different, but we are all alike." 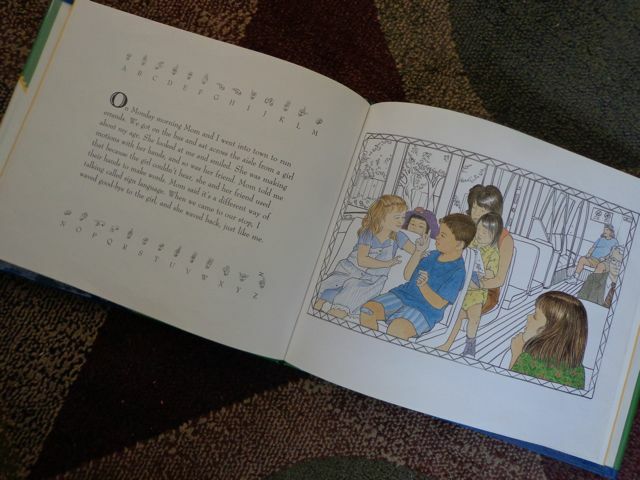 However, Lori didn't find exactly what she was looking for, and she decided to write and illustrate a book that would help her daughter. (Different Just Like Me, YouTube). In the inspiring video below, April mentions the impact that Different Just Like Me had on her life, "It helped me a lot when I was little to realize that it is okay that I am different." I have so many good memories of my birthday growing up. Every year my mom would make my favorite meal, beef stroganoff, and she would make grandma's cheesecake for dessert. I would sit at the head of the table, in the dark, with only the glow of the candles on my cake. I would wear the small gold, cardboard birthday crown that everyone in the family would wear on their birthday. I would make one spectacular wish and blow out the candles, all in one breath, so as to guarantee that my wish would come true. Now that I'm grown I celebrate in a little different way. When I turned 50 my husband and I decided to do 50 things we had never done before. We took a drive up the coast to begin our adventure. We stopped in at a German meat and cheese store in Carlsbad and tried different cheeses and meats from around the world. We took a ride on a huge Ferris wheel in Irvine that we had never been on, we ate dinner with our left hands, and so on. We just kept our eyes open for any new thing we could do so we could add it to our list. 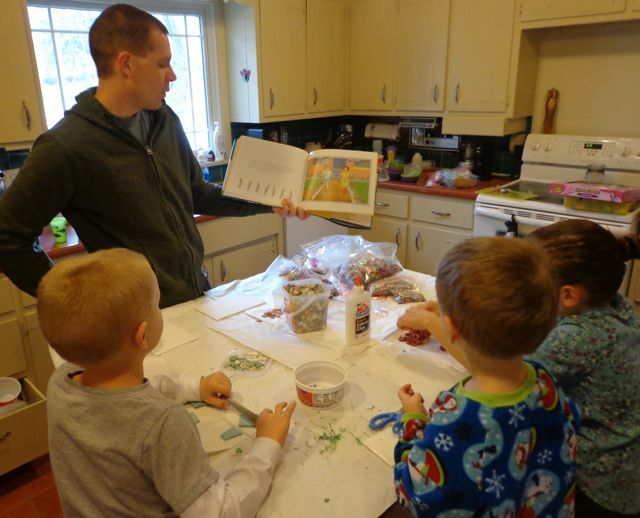 In addition to being an author-illustrator, my kids and I noticed in the author profile on the jacketflap of Different Just Like Me that Lori Mitchell enjoys creating mosaics. 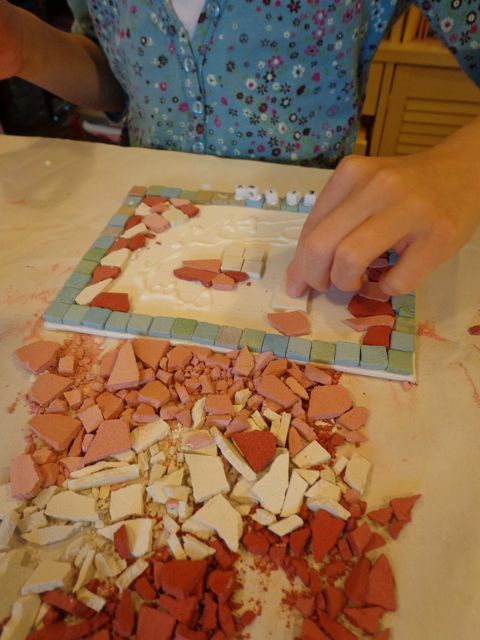 According to her website she has been creating mosaics since 1990. A huge 7 foot by 4 foot mosaic she worked on with 350 students at Mann Middle School was featured on HGTV's Crafters Coast to Coast. 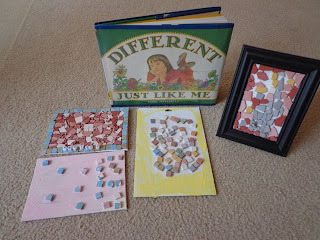 Lori even has mosaic boxes, frames, and plaques available for purchase on her website, MitchMo. I thought creating mosaics to celebrate Lori Mitchell's birthday would be a fun activity for my children. I didn't tell them that we were going to make the mosaics until we were at the craft store to buy the supplies. They picked out a box of small square colored tiles and a box of large square tiles that could be broken into smaller pieces. 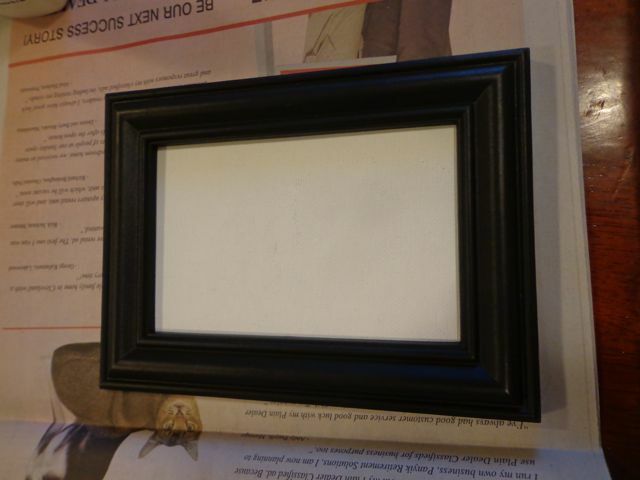 We also purchased a pack of 4"x 6" canvas panels. My children skipped to the front of the store because they were so excited for the project. 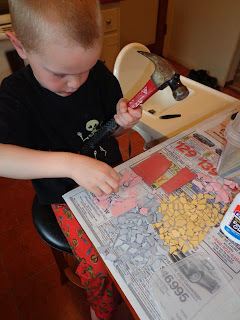 At home, we prepared our work area with newspaper, viewed Lori's mosaics on MitchMo and gathered all our supplies -- beads, tiles, white glue, canvas panels, a hammer for breaking the tiles, pencils, and Different Just Like Me. We started the activity by reading Different Just Like Me. Everyone took a turn cracking the tiles with a hammer. I think they would say that this was their favorite part of the whole activity! 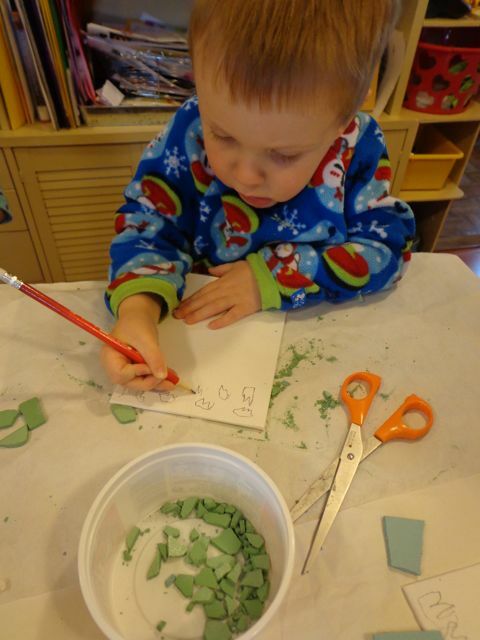 My son chose to sketch his mosaic design on the canvas with a pencil. 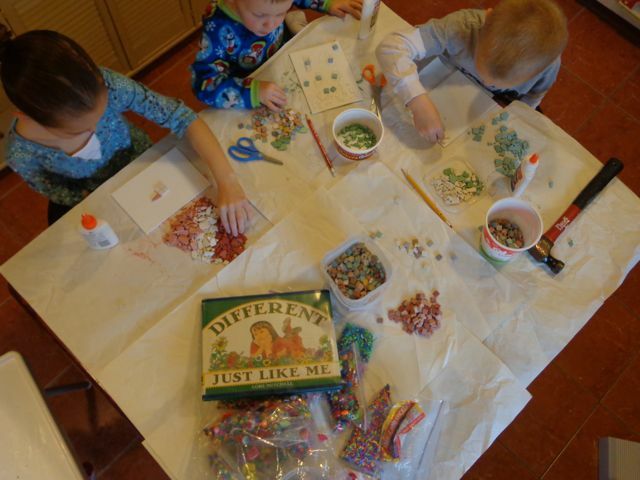 It was very quiet at the beginning of this activity as they carefully arranged and glued their pieces on the canvas. My daughter chose not to sketch her design on the canvas. 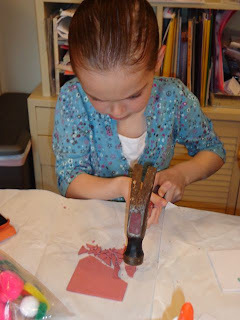 She wanted to work by patterning tiles around the edges and then filling in the center with the cracked pieces she made with the hammer. 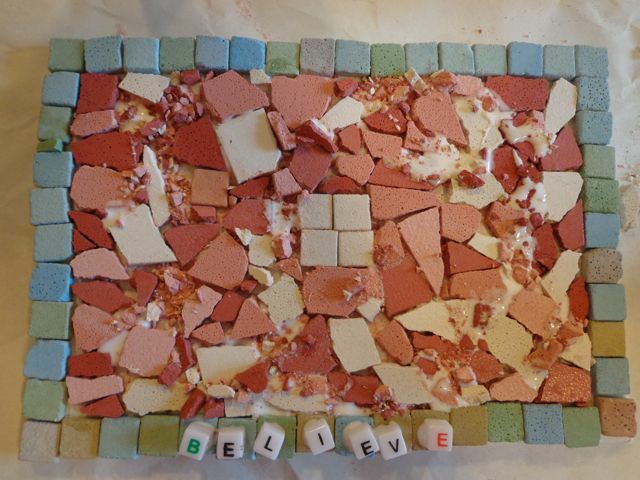 She completed her Mosaic by adding the word BELIEVE with letter beads. A few days later my boys were interested in working on another Mosaic project. This time I gave my oldest son his canvas inside a frame. My youngest son opted to paint the white space from his previous mosaic project. 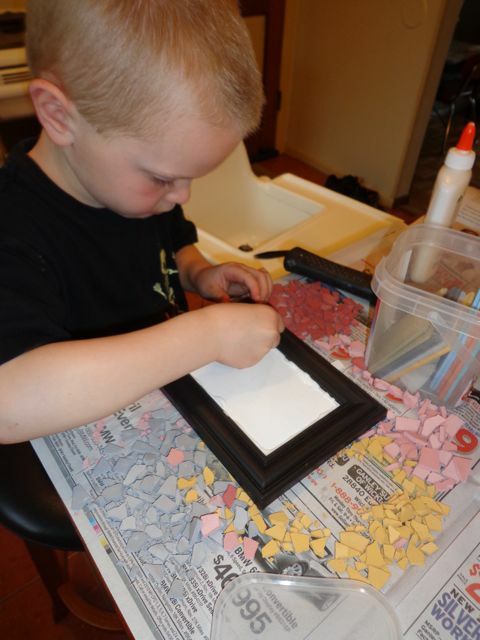 He took great care in preparing his pieces for the framed mosaic project. He said that he preferred using the frame and was motivated that he was going to be able to hang it on his wall in his room! 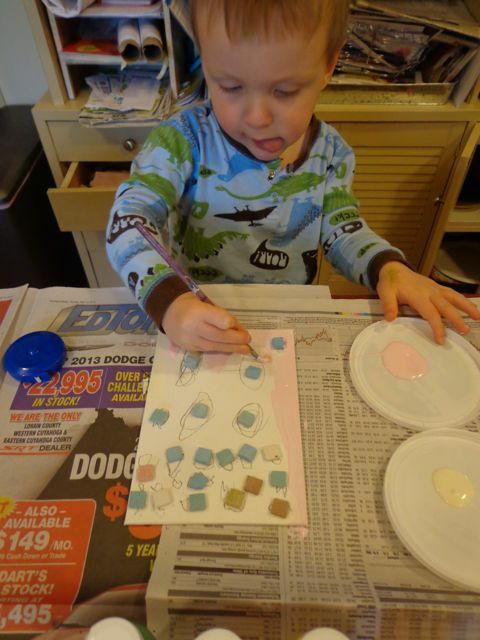 Not only did my youngest son paint his previous mosaic, but he wanted to design another. 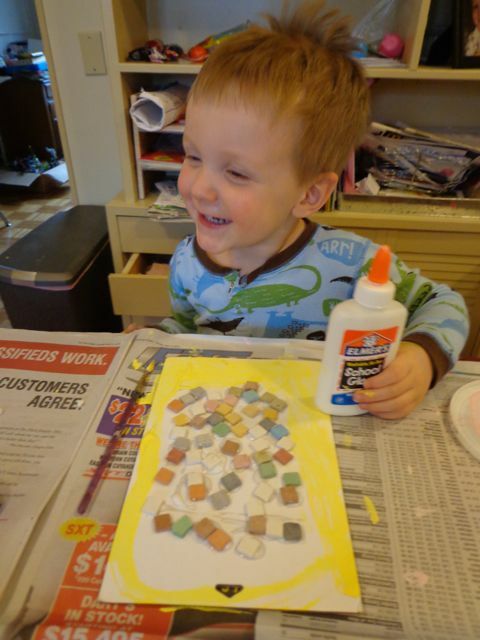 This mosaic was arranged and glued on a piece of cardboard. He called this mosaic "The Park." 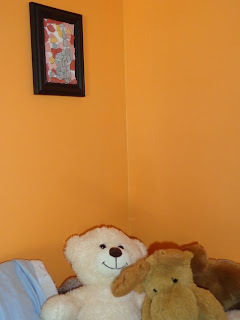 After my son hung his mosaic above his bed he said, "My famous piece of artwork." Our mosaics were similar to the flowers in April's Grammie's garden, "different from one another and that's what makes them so great!" Lori, we are so happy that you contacted us to share your birthday. 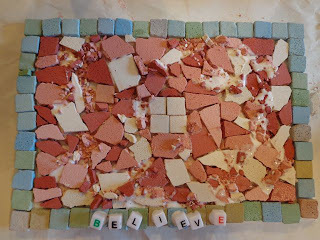 We had a memorable experience reading Different Just Like Me and making mosaics. Thank you for taking the time to share your birthday memories! We hope you have a wonderful birthday and hope your "one spectacular wish" comes true this year!